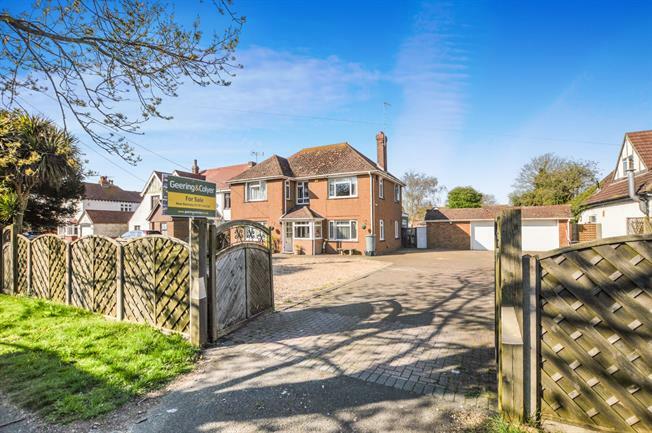 5 Bedroom Detached House For Sale in New Romney for Asking Price £575,000. Substantial five bedroom detached family house on a large plot with double garage. The entrance porch leads to the hallway with stairs to the first floor. Triple aspect lounge with brick open fireplace with brick hearth and French doors leading to the sun room which has French doors to the rear garden. The study could be used as fifth bedroom if required. Downstairs shower room. Utility Room. The kitchen has a range of wall and base units with sink unit set in work top, central island, space for range cooker. Open plan into the family room which overlooks the rear garden. Upstairs are four double bedrooms and a shower room. To the front of the property is parking for numerous vehicles with turning space leading to the detached double garage with two electric roller doors 19'2 x 19'6, power and light, additional storage room to the side 7'9 x 19'6. The rear garden is mainly laid to lawn with patio area and shed.